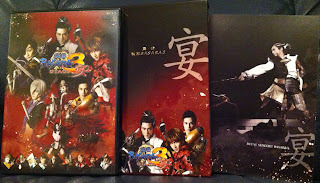 It's time for to review the very last Butai Sengoku Basara stage play starring Kubota Yuuki and Hosogai Kei in the roles of Masamune and Yukimura! Butai Sengoku Basara 3 Utage originally ran for 29 performances between 26th April and 26th May 2013 at venues in Fukuoka, Nagoya, Osaka and Tokyo. The Osaka shows sold out months ahead of opening night and there was a 'live viewing' event held in 25 cinemas across Japan on the last day to let as many fans as possible watch the grand finale together. A DVD followed as usual, originally scheduled for September then brought forward to its eventual 31st August 2013 release date. The ¥6,000 standard edition can still be purchased from the Dais Shop, Yesasia and Amazon Japan. Amazon also seems to have a small number of copies of the ¥6,500 special edition left at the time of this post, presumably from cancelled preorders as they had sold out the last time I checked. The special edition DVDs tend to go out of print quickly and then rapidly increase in price; it's best to purchase them as quickly as possible. The version I'm reviewing today is the special edition. It comes in the usual glossy card box with a thin colour booklet of photographs from the play (and a few candid backstage shots). The 188-minute DVD recording of the performance is inside and there's a bonus disc included with 83 minutes of extra footage. I'm guessing the standard edition looks the same as the DVD case on the left side of the photograph. Regular Butai Sengoku Basara director/organiser Nishida Daisuke created the play with guidance from the Capcom team and Kobayashi 'KobaP' Hiroyuki. With so many new names, there's a fresh feel to the cast and even Nobunaga has returned to the series for the first time in years. Please note that my descriptions may include a number of spoilers for the content of the play. Having covered the main storylines from Sengoku Basara, Sengoku Basara 2 and Sengoku Basara 3 already, the recent stage plays have started to weave some of the untold side stories from earlier games into the script. I was initially worried that they wouldn't have that much material from the titular Sengoku Basara 3 Utage left to use with the characters that were slated to appear, but aside from Hisahide's clashes they've chosen to combine scenes from Sengoku Basara 2 Eiyuu Gaiden (Heroes) with content from 3 and Utage to tell the full tale of what happened to Mitsuhide, Oichi and Nobunaga after Honnouji, once and for all. The plot is reasonably coherent as a result...it's just incredibly dark. This is the bleakest that Butai Sengoku Basara has ever been. The opening scene drops straight into a battle between Nagamasa and Nobunaga with poor Oichi watching helplessly from the sidelines. Even though she tries to intervene, she's unable to prevent Nagamasa from being slain right in front of her. Masamune and Yukimura arrive at the same moment to challenge the Demon King and Mitsuhide joins in the four-way battle - before turning traitor and cutting Nobunaga down himself. It's on this intensely dramatic note that the usual lengthy title sequence begins, introducing all of the characters amidst a medley of vocal songs from the series. The consequences of that first battle then play out over the next few hours, complicated by the presence of Matsunaga Hisahide, the most cruel villain of all. Actor Matsuda Kenji carries the role of Hisahide perfectly, calmly walking through fire and explosions with a look of unsmiling intimidation permanently etched on his face. His costume is amazing. Naturally, the legendary ninja Fuuma Kotarou is at Hisahide's side to carry out much of his dirty work. I wasn't sure how a silent character would work in the live plays when so much of the drama comes from shouted dialogue; thankfully, Kotarou gives off exactly the same impression that he does in the games. He even performs some typically ninja-like stunts! Although Hisahide and Kotarou are unpleasant enough on their own, Kubodera's Nobunaga returns to the stage play series too after a long absence. He fits right in as the resurrected Demon King with his eyes flashing wildly at his opponents. His armour has been greatly improved since the early days of Butai Sengoku Basara (I thought his tattered cape looked particularly cool). Completing the ranks of the main antagonists is Mitsuhide. Taniguchi finally has the chance to play the role to its full potential, switching between his Mitsuhide outfit and the Tenkai mask depending on the scene. It's great to see his face again without the mask; he gets plenty of opportunity to be expressive in some incredibly dramatic scenes. At one point during Nobunaga's revival he brutally hacks away at himself - it's unsettling to watch. I was already familiar with Tamaki's singing career before her debut in this play and she's a breathtakingly beautiful Oichi. Her 'dark hands' are represented by disembodied arms coming out from various parts of the stage which looks a little strange if you think about it too deeply; thankfully whether she's sobbing, singing or swinging her naginata Oichi herself looks so wonderful that I didn't have much time to question the special effects. With so much potential for tragedy during climactic scenes, the comedy characters have a lot of work to do to keep the mood light in between. Yoshimoto's main role is to antagonise poor Nagamasa in flashbacks and thoroughly irritate everyone else he makes contact with. The glittering fan he wields works surprisingly well and his quavering voice is pretty good. This play allows him to meet Yoshiaki for the first time since they've never appeared in the same game before. Speaking of Yoshiaki, he's (unwillingly) travelling around Japan, showing up unexpectedly whenever it's time for some light comic relief. Imai is a seriously agile guy and this Yoshiaki leaps and tumbles around as required, never far from his trademark cup of genmai tea. More so than anyone else his voice is very different from the game version; he's as boastful as ever but his weaselly manner of speaking is toned down significantly. Tsuruhime is even perkier than usual now that she has Kotarou to chase after. I was expecting her to team up with Magoichi again but here she's first seen tagging along with Ieyasu to help him take care of Oichi. In contrast Magoichi's appearance seemed very brief even though it was of major significance to the plot. The excellent team of Nakamura and AKIRA reprise their roles as warring generals Shingen and Kenshin respectively. Kasuga's absence is unusual (she's returning in the next play) and Shingen spends less time instructing Yukimura and Sasuke than before, so Kenshin and Shingen are able to devote time to being rivals to one another instead of dealing with other characters. Shingen is still suffering from the illness which plagued him in the Sengoku Basara 3 plot. However, it doesn't seem to stop him rushing into battle, throwing punches at friends and foes alike and dispensing his usual sage advice whenever necessary. As a result Yukimura is full of life and his usual foolish, battle-crazy self. He's behind some of the best comedy moments in the entire play; I'm glad that actor Hosogai showed off the full potential of his adorable Yukimura in this final outing. Speaking of Sasuke, he has a smaller role this time with the exception of a memorably heroic battle in the second half. Kotarou's stoic nature makes Murata's portrayal of the Takeda ninja seem even more happy-go-lucky than ever. Mitsunari barely appears in the first half, spending his time wandering alone seething with uncontrollable hatred. While he fares slightly better towards the show's climax, of the two of them it's Ieyasu who gets the lion's share of stage time. There's something indescribably likeable about the stage version of Ieyasu. His fighting style looks fantastic in person, and his good-natured personality lets him interact comfortably with characters as diverse as Yoshiaki, Tsuruhime, Oichi and Masamune. 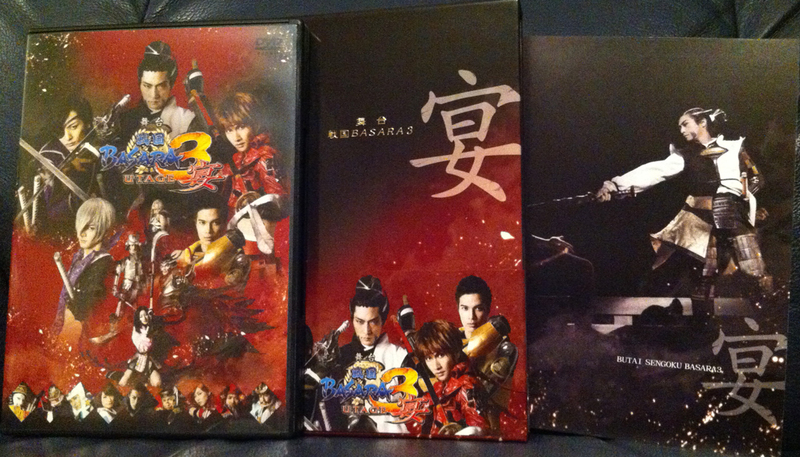 The staff were very lucky to find actors who fit the roles of Mitsunari and Ieyasu as well as Nakamura and Hirose. Finally, there's Masamune and Kojuurou. As my two favourites aren't directly involved in the plot of Butai Sengoku Basara 3 Utage until the battles in the second half, the main job of the Date army is to contribute comic relief with their rowdy battle warm-ups and occasional moments of self-parody. It's very sad to think that this is the last time I'll see Kubota and Yoshida working together as Oushuu's twin dragons in a live stage play. The two have become the live action versions of their characters to me after all this time. The extras disc doesn't disappoint, containing a long 'making of' documentary showing the backstage arrangements and footage of the actors preparing, giving comments to the DVD audience and generally fooling around. I enjoyed seeing Kotarou speaking in costume during his interview and a candid shot of the actresses dressing up in the wrong costumes backstage for fun. This documentary includes the extra curtain call from the finale where Kubota and Hosogai said their last tearful farewells before graduating from the cast. Individual interviews with Kubota and Hosogai add some closure to this, letting them speak about their memories from previous Butai Sengoku Basara plays in a more relaxed environment backstage. There's also a short interview with Sakuma Hiroto, the actor who plays the old soldier in the Date forces (an original recurring character for the stage play series). It's nice to get a chance to see him up close since he's going to cameo in Sengoku Basara 4 as a background character. There are two more extras on the disc. One is footage from the talk show that was held after one of the performances with Nishida, Kubota and Hosogai. It's very funny as the other actors occasionally walk on from the sidelines wearing a shocked expression whenever one of the leads makes an irreverent comment about them. The final feature is the now-traditional 'Air' Basara display with the supporting actors demonstrating the battle scene choreography without the presence of any of the main warriors. Fans who only want to see the main play won't find much of interest on the extras disc. For those who have become attached to the cast, however, it makes for a lovely send-off for the two lead actors. I watched the whole DVD in one evening in spite of its length. The picture quality was excellent for a live recording and there's only one word to describe my reaction the first time watching this stage play: shock. While most of the dialogue and scenarios were taken straight from the games, it was surprising that they allowed Hisahide's story to play out right the way to the end of the show. It's now easier to understand why the upcoming Butai Sengoku Basara 3 Utage II play is going to highlight Mitsunari, Kojuurou and Sasuke over the other members of the cast. 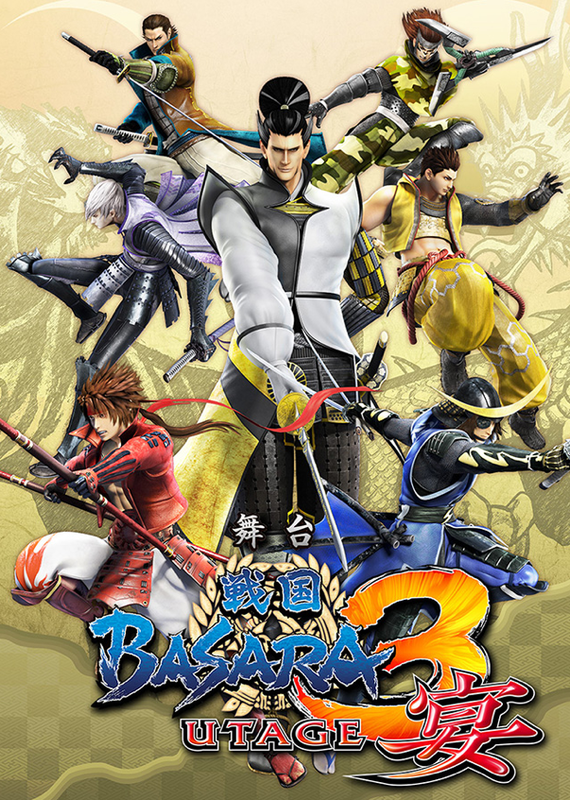 Mitsunari's role here was tiny compared to Ieyasu's and the two loyal retainers missed out on the key roles they played in the Sengoku Basara 3 Utage game. It's only fair that the three of them get a turn in the spotlight next time around. Press reports from the live performances can be seen on the 4Gamer.net, Dengeki and Famitsu websites. The pictures I used in this review were taken from the Dais Shop. I bought it because I got so curious, without knowing if it was going to be good or understandable – luckily it turned out to be an enjoyable experience! The intro with everyone showing off their fighting styles was so impressive that I thought it was worth buying it for that alone. The rest didn't disappoint either. It's just really great and weird to see a group of attractive and talented people pretend they are your favourite videogame characters and doing it well! There are two arches that the special effects are projected on (when people do their special moves and such) and it works well. The stage itself it empty from props and decor most of the time so the setting might not be clearly shown. Of course the stage is kept empty because everyone is running all over it all the time fighting. It's easy to follow what's happening in this if you're a fan of the series. It's not like it's the most advanced plot either - basically characters meet, fight, have drama or team up and do silly things. However at times I'd really liked to know exactly what was being said. The play is unexpectedly long, 3 hours so breaks might be needed! I really enjoyed watching this - almost everything. Worst part was Yoshimoto who is like a scary annoying clown, couldn't stand him. Yoshiaki, another character that could be annoying is toned down in this and it really worked, and he seemed classier like he thinks he is! There is a longer "party" segment with the Date and Takeda playing games and making jokes and it was just bizarre to watch. There are also some fight scenes towards the end that are drawn out which makes them loose their impact some. The big villain of the story is Matsunaga, the actor is a short guy wearing too much makeup (it's a stage play after all, you're not actually meant to see them close up but most look great anyway) however you don't really think about that when he fights and does evil expressions and cool explosions. My reaction to a majority of the characters was "Aww, he/she looks so cute and short" because they're real persons not impossibly badass/scary elongated videogame people. It's not like it's a bad thing; I found it endearing. Mitsunari in particular, he just so cute, short and sad in this! Haha. Special mention to Oichi who is played by a singer and she is just perfect for the role and gorgeous. Her shadow hands are real hands being waved by the extras offstage and it looks both creepy and funny. Ieyasu is totally hot and Yukimura is just adorable but hurt my ears with his yelling. I also liked the very pretty and young Kojuurou who despite not completely looking the part acted well and Masamune who had rather violent english lesson going on and broke the fourth wall with "DVD!" Basically everyone else was good too with great styling and played with much enthusiasm. The story has both comedy scenes and darker scenes and sometimes they clash. As Raindrops describes it’s a darker story. With the red and black cover you can tell it's not going to be super light-hearted party, and there is certainly a lot of sadness and bloodshed. Some scenes were heartbreaking. I applaud everyone involved who managed to make a stage play with Capcom characters touching like that. The ending was pretty special, can't say anything about it that won't be a spoiler but it was neat. So I'm satisfied with having bought and watched this stage play & basically got a crush on a bunch of the actors. 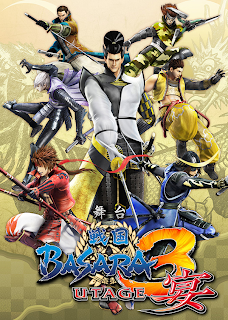 If some Basara fan out there is thinking of getting it seriously do I don’t think you’ll be disappointed. I'm glad you liked it! It's true that some of the makeup looks funny up close, since the actual audience will never see it that way. Reading your review reminded me of a lot of great scenes so it was a lot of fun! My Takarazuka musical DVD is in transit now so it's going to be seriously weird watching the glamorous all-female version of Sengoku Basara so soon after this dark, depressing stage play! I didn't think it was that depressing - maybe I was too occupied thinking it was cool and not understanding everything, and then everyone came back out on stage afterwards and looked all happy and out of character which was funny. OK enjoy the musical, it sounds very odd! I thought the ending of Utage was pretty brave and I'd really like to know what was said during the very last scene. Do you think you could possibly translate that? You're probably extremely busy though and I totally understand if you say no! I'll try to take a look this weekend if I have time for the exact wording. Do you mean the scene with Hisahide and Nobunaga alone? Whoa that's really nice of you to consider! Yes that's the scene. Ok, it's short so I was able to take a look. It's hard to write Hisahide's speech in English and retain the 'flavour' of his Japanese. Hisahide: It's been a delight to receive all of the fun that you've given to me. So, my good sirs...I'll present you with a party ('utage')! Now Hisahide is drinking tea with Nobunaga. Nobunaga grunts. Hisahide: How about that, Nobunaga-kou? Nobunaga: It's 'sweet dew' (note: this is an actual type of tea, he's not just being weird). Hisahide: Mm, a wonderful flavour. As expected, the taste of the tea you had in mind for this tea ceremony is exceptional. Hisahide: There is still treasure I haven't seen, and 'good sirs' I've yet to meet. Where is it...? My pleasure :) thank you, as always, for the engaging Sengoku Basara comments!